Let’s get the easy part out of the way first. Bernie Sanders went into the New York Democratic primary with essentially no path to catching Hillary Clinton in the race for the Democratic presidential nomination, and he leaves it with even less of one after Clinton’s victory. Despite some national polls showing the race effectively a tie, Clinton has a lead in pledged delegates and superdelegates that Sanders cannot catch. Unless Clinton is somehow forced from the race, she will be the nominee. Sanders assuredly still has some victories to come, but the eventual outcome really is not in doubt. Now, on to the Republicans, where the outcome remains very much in doubt. Donald Trump did what he needed to do in New York on Tuesday night. He easily eclipsed 50% of the vote statewide and in most of the congressional districts, giving him 90 of the Empire State’s 95 delegates (as of Wednesday morning). His path to winning a delegate majority remains open, but it is perilous. Table 1 provides a roadmap for how Trump could get to the 1,237 delegate mark. It is not a prediction of how he will perform — the potential pitfalls are many for him to accomplish the feat — but is meant to show there is at least some reasonable chance that he could still reach a delegate majority. But that’s far from a certainty. We did not overreact to Ted Cruz’s victory in Wisconsin and declare that a contested convention was all but certain, and we’re not going to overreact in the other direction after Trump’s strong New York victory. Note: Colorado, North Dakota, Wyoming, and Guam are not included in the table even though they have some unbound delegates still pending. Trump could win support from a small number of delegates in those states and/or support from bound or unbound delegates who are officially uncommitted in other states and territories as well as delegates currently bound to former presidential candidates. As things stand after New York, Trump is at 847 delegates (846 bound, 1 unbound based on The Green Papers’ count and the AP’s congressional district results). There are 620 remaining bound delegates, which means Trump needs to win 63% of them to get to 1,237 bound backers. To just attain 1,237 delegates regardless of bound status, Trump must win about 56% of the remaining 700 delegates (the 620 bound, as well as 80 unbound from Colorado, Guam, Pennsylvania, North Dakota, and Wyoming). This does not include any gains among delegates allocated to former candidates or officially uncommitted delegates (bound or unbound). Given the opposition to Trump that exists within the party, the fully bound path may be the only sure thing for him. However, there may be additional unbound delegates who will back him, though only one has announced support up to this point. With that overview, here are the five most important tasks Trump must complete in order to get to a delegate majority. Completing all five of these tasks will not be easy, to say the least. Five northeastern/mid-Atlantic states vote next Tuesday, and Trump appears to be a favorite in all of them: Connecticut, Delaware, Maryland, Pennsylvania, and Rhode Island. However, in four of these five states, just winning won’t be sufficient. In Connecticut, Trump can sweep all 28 delegates. Given the results in neighboring Massachusetts and New York — Trump won just under 50% in the former and far over in the latter — that seems like a real possibility. If Trump wins a majority of the vote in Connecticut, he will get all 13 statewide delegates. The other 15 delegates are awarded winner take all by congressional district. Trump could very well win all five, although John Kasich could perhaps challenge him in the affluent Fourth Congressional District. Trump just about maximized his delegate haul in New York: Can he do it in Connecticut, too? Trump should also do very well in Rhode Island, but it awards its delegates in a very proportional manner, so all three candidates will almost certainly win delegates there. The best Trump practically could do is to win 10 of the state’s 19 delegates, but nine is a more realistic goal. Maryland is winner-take-all statewide and by congressional district. A realistic goal for Trump is winning all the statewide delegates and six of the eight congressional districts, or 32 of 38 delegates. Anything worse than that narrows Trump’s path to a majority. Kasich could be Trump’s main challenger in the Washington, D.C. suburbs, which were hostile to Trump in Virginia’s March 1 primary. However, the D.C. suburbs are split among several different congressional districts, which could dilute Kasich’s vote and benefit Trump. Finally, there’s Pennsylvania. Trump is leading there by a significant amount in recent polls. But only 17 of the state’s 71 delegates are pledged to the statewide winner. The other 54 are directly elected and officially uncommitted. However, some have said they would support the statewide winner or the candidate who wins their congressional district. A big statewide win by Trump could effectively net him more than just 17 delegates in Pennsylvania, and he’ll almost assuredly need more than just 17 votes from the Keystone State to win the nomination on the first ballot. So Trump needs to put on a show for the Pennsylvania uncommitteds by not just winning, but winning big. Of course, there would be nothing to stop the uncommitted delegates from voting for someone else besides Trump on the convention floor, claiming perhaps that they “did what was best for the party.” So the potential reliance on these delegates to get over the top is a serious problem for Trump. 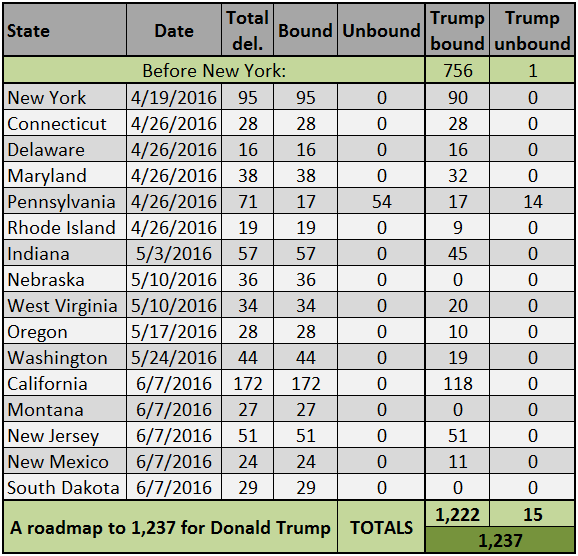 But as Table 1 shows, if Trump were to get 14 of those unbound delegates (so about a quarter of them) and the rest of this roadmap played out as written, he would arrive at the magic majority number of 1,237. The one state where winning by a single vote would be just fine for Trump is Delaware, which is a straightforward, winner-take-all state. There’s little reason to think he won’t do that. The anti-Trump forces appear to be hoping to re-run their successful Wisconsin strategy in Indiana, another Midwestern state that awards its delegates winner-take-all statewide and by congressional district. That means the statewide winner, in all likelihood, will win the lion’s share of the delegates. Cruz is very clearly gunning for Indiana, and Trump may not have a path to a delegate majority without it. The New York Times’ Nate Cohn wrote an informative analysis of Indiana that begins by arguing “It may be Indiana or bust for Donald Trump.” He’s probably right. We think Indiana is fairly similar to Missouri, a Midwestern state with a southern orientation. Missouri also happened to be the closest primary in this year’s race: Trump won statewide by about 0.2 percentage points as both he and Cruz got about 40% of the vote. Cruz will almost certainly have to clear 40% to beat Trump in Indiana, and he very well could. There’s little question that West Virginia, an almost entirely white state with lower-than-average levels of median income and education, is tailor-made for Donald Trump. The Mountain State is the only state that is entirely defined as part of Appalachia, the 13-state generally white, working-class region that extends from western New York all the way to northern Alabama and Mississippi, and Trump has done very well in Appalachia so far, winning 297 of the 318 Appalachian counties* that have voted so far. It would be a gigantic upset if Trump did not win the most votes in West Virginia. However, that does not necessarily mean he will win all or even most of the delegates. Only three of the state’s 34 delegates are bound to the statewide popular vote winner. The rest are directly elected on the ballot, as in Pennsylvania. While delegate candidates are listed with a presidential preference (or are listed as “uncommitted”) on the ballot, unlike in Pennsylvania, the voting process is very tedious and time-consuming. Among the complications: voters will have to choose 22 at-large delegates. They cannot choose more than 22, or all of their selections will be thrown out, and they also cannot choose more than two from any one county. To read more about the confounding intricacies of the West Virginia primary, check out these pieces from Hoppy Kercheval of MetroNews in Charleston and Kyle Cheney of Politico. But the bottom line here is this: Trump may dominate the popular vote in West Virginia but not even get a majority of the delegates. In Cheney’s write-up, West Virginia’s GOP national committeeman said he was skeptical that Trump could win more than 20 of the Mountain State’s delegates. Trump’s threadbare organization faces a stern test in educating the state’s voters on this confusing process; otherwise, he may fall very short of his target in West Virginia, which really should be winning every single delegate. Our roadmap above has Trump winning only 20 of 34 West Virginia delegates, which is perhaps conservative for Trump, but it reflects the uncertainty in a state that otherwise seems quite favorable to him. There are limited data to work with for Oregon and Washington, two states that both use mail-in voting, though the demographics suggest neither is great territory for Trump. While Oregon uses an almost purely proportional system based on the statewide vote, Washington’s district system is akin to New York’s: If someone wins a majority in a district, that candidate wins all three district delegates; otherwise, they are awarded 2-1 to first and second in most cases. But the Evergreen State’s statewide delegates are awarded proportionally with a 20% threshold. An added complication in Washington is that Democrats already held their caucus on March 26. Although there is a Democratic contest on the primary ballot, it has no bearing on delegate allocation. As Washington doesn’t have party registration, it’s possible that some Democrats could opt to vote in the GOP primary, even if it requires them to sign an oath declaring they are Republicans and haven’t participated in another party’s nomination process — given caucus turnout, many Washington Democrats surely didn’t. This could swell GOP vote totals, perhaps to Trump’s detriment. Meanwhile, New Mexico is positioned between Trump territory in Arizona and Cruz country in Texas, so it could be very competitive. But the Land of Enchantment allocates proportionally by statewide vote, though with a 15% threshold that Kasich might struggle to reach, meaning it will be difficult for anyone to win a large share. Trump doesn’t need to win all these states, and we suspect he probably won’t win either of the Pacific Northwest states. But he needs to get some delegates out of them; probably somewhere around 40, as noted in Table 1. California, which along with four other states votes on the final day of the primary calendar, awards 159 of its 172 delegates via winner-take-all by congressional district. This will be a 53-district battle for three delegates in each. The well-respected Field Poll recently found evidence that Cruz may challenge Trump not only in some conservative parts of the state, such as the Central Valley, but also in Los Angeles County. Meanwhile, it’s possible that Kasich could peel off some wealthy, highly-educated districts in the Bay Area. Outside of LA, Trump leads by a large margin in the rest of Southern California, analogous in some ways to his large win in Arizona. Overall, Trump can’t plausibly sweep the state, but if he wins statewide by enough he should win plenty of congressional districts. In terms of overall delegate arithmetic, he is going to need to win close to two-thirds of the districts; winning 35 districts and statewide would work out to 118 delegates. At this point, we’re assuming that Cruz will capture the winner-take-all states of Nebraska, Montana, and South Dakota. This is based primarily on Trump’s general underperformance in much of the Great Plains and Interior West. Additionally, both Nebraska and South Dakota are closed primaries, which have overall been a boon to Cruz (Montana is not, and perhaps Trump could be more competitive there). There’s really no polling to guide analysis in any of these three states, and maybe there’s more support for Trump than we think. Therefore, we can’t completely rule out the possibility of Trump winning one of these states even though, in all likelihood, he will not. There’s one description of all five of Trump’s steps above: challenging but possible. This also describes Trump’s chances of getting to the magic number of 1,237 by the end of the primary season. If he does not make it but is close, perhaps within 100 delegates or less, it’s possible that he could persuade some uncommitted delegates (like members of the Pennsylvania contingent) to come to his side. But if he’s considerably short, by 100 delegates or more, then his path to victory is likely closed: Trump simply does not seem to have the organizational wherewithal to win a convention that goes to multiple ballots, particularly because Cruz is running circles around him in the actual selection of delegates. There may be a majority bound to Trump on the first ballot at the convention, but we doubt that a majority of delegates, in their heart of hearts, will support Trump if given the option of defecting. That’s why Trump winning a majority in New York was so important to his chances — but also why he has several difficult hurdles remaining in front of him. *There are 428 total Appalachian counties, a total that includes eight independent cities in Virginia. So far, 10 of the 13 states that include Appalachian areas have held caucuses or primaries: Alabama, Georgia, Kentucky, Mississippi, New York, North Carolina, Ohio, South Carolina, Tennessee, and Virginia. The three that have not are Maryland, Pennsylvania, and West Virginia.